Stephen Kokoska’s Introductory Statistics: A Problem-Solving Approach demonstrated that when presented in a precise step-by-step manner, with an understanding of what makes the material difficult, statistics can be made accessible, meaningful, and useful, even to the most skeptical students. 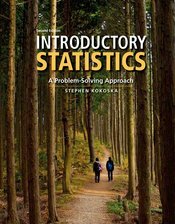 In this thoroughly updated new edition, Kokoska again combines a traditional, classic approach to teaching statistics with contemporary examples and pedagogical features, blending solid mathematics with lucid, often humorous writing and a distinctive stepped “Solution Trail” problem-solving approach to help students understand the processes behind basic statistical arguments, statistical inference, and data-based decision making. The second edition is a fully integrated text/media package with its own dedicated version of LaunchPad, W.H. Freeman’s breakthrough online course space.